Speed Queen and Kenmore Elite are two brands you can never actually compare because Kenmore is in Sears/Kmart and Speed Queen is in independent dealers only. These machines could not be more different either. Kenmore Elite is a fancy gadget oriented product whereas Speed Queen is a solid, rugged tank of a machine. We will look at both companies, both machines and then compare. The first Kenmore washer appeared in 1927 with a ringer for an agitator. That machine was never featured in the Sears catalog and there is no known picture of the first Kenmore. By the year 1936 Sears had already sold over 1 million pieces of laundry equipment. Legend has it that the origin of the Kenmore name was derived from Kenmore Avenue, a prominent street in Chicago. The Kenmore Elite washer was introduced in 2001. Today you can find such brands like LG, Samsung, Frigidaire and Whirlpool manufacturing washers for Sears with LG and Whirlpool producing most of the Kenmore Elites. 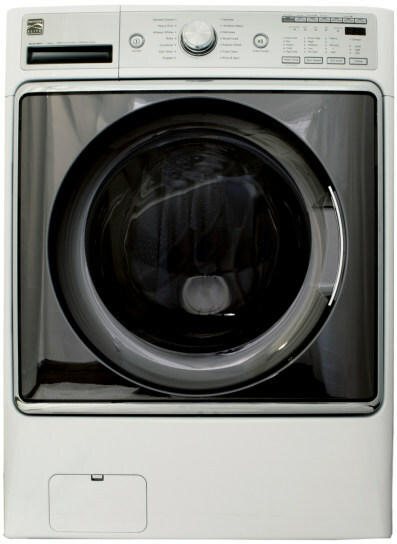 Kenmore Elite washers typically are available in two sizes: either 4.5 cubic feet and 5.2 cubic feet. The Kenmore 41483 has an average selling price of $1,299 and the #41072 has an average price of $1,070. Kenmore Elite 41483 at 4.5 cu. ft.
Kenmore Elite 41072 at 5.2 cu. ft. 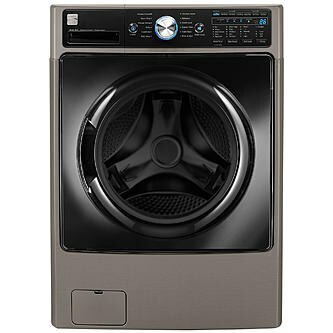 The Elite washers have always been known for offering an array of features and benefits. 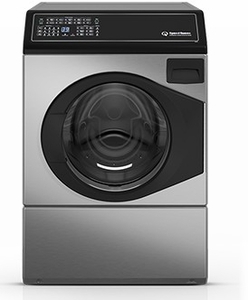 With Smart Motion the machine can adjust up to 6 different wash motions allowing you to customize the wash action. Both machines offer a sanitize wash (certified by NSF) to eliminate up to 99.9% of common bacteria. With wash cycles like whites, heavy duty, normal, delicate, extra rinses combined with a delay start the machine has every major feature. The machines feature an anti vibration system (I still would not put it on a second floor) to help reduce noise as well as vibration. The interior of the washer is stainless steel and has drum paddles designed to lift the clothes and drop them for a more delicate wash compared to the older agitator style top load machines used. 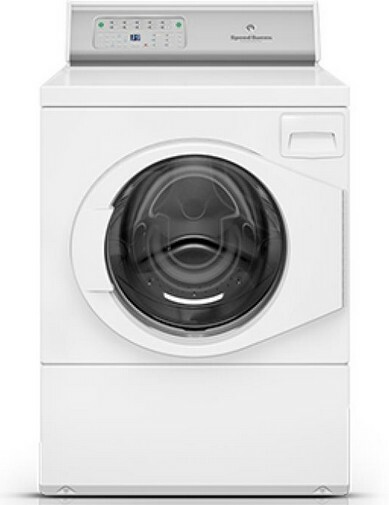 The Elite washers spin at an average of 1,200 RPM to ensure good moisture removal. The machines cycle options are rated 15% higher than average, once again giving you a lot of bells and whistles. Overall it is a nice machine. Kenmore has been built in the past by different vendors so the features may change a bit. In 1908 two hardware store owners in Ripon, WI, Joe Barlow and John Seelig purchased 2 hand powered washing machines from a company in Kansas City MO. After experimenting with the machines they figured out a way to increase the machines efficiency using high speed gears. The company produced washers under the White Cloud name until 1928 when they changed the name to Speed Queen. The first washers were built with a nickel copper tub. In 1939 Speed Queen changed the tub to stainless steel which is still in use today. The stainless steel tub is a visible sign of their commercial design. Today they still use the commercial technology in their residential machines and back it up with the best warranty in the business. Let’s take a closer look at the Speed Queen. Speed Queen offers a front loader with controls on the front (AFNE9BSP113TN01) for $1,899 or $2,499 stainless steel or controls at the rear (AFNE9RSP113TW01) for $1,799. Unlike the Kenmore Elite which offers you endless features, Speed Queen preaches mainly about reliability and durability. Unlike other machines using plastic interior parts Speed Queen residential machines are built with commercial parts. They use all metal parts designed for 25 years of life. Speed Queen front load washers feature a 5 year warranty on parts and labor. That compared to a 1 year warranty of the Kenmore Elite. Like the Kenmore, the tub interior is made of stainless steel and is 3.42 cubic feet. The exterior cabinet is comprised of galvanized steel, not the painted enamel of other manufactures. The galvanized steel helps prevent any rust build up over the long life of the machine. The washer door is supported by a 10 inch stainless steel hinge designed once again for long term use and reliability. Speed Queen also uses what is called Dynamic Balancing Technology. This technology employs sensors and algorithms to virtually eliminate vibration. The results are less moisture in the clothes, faster drying times and quieter operation for a second floor. The Speed Queen front loaders still offer you the cycles you would need like regular wash, delicate wash, high temperature wash and extra rinses so all the basics are covered. Kenmore Elite will offer a better price and more cycles whereas Speed Queen has a much better warranty and is comprised of better materials for longer life at least in theory. It may depend on where you want to buy it. Kenmore Elite is only available at Sears and Kmart whereas Speed Queen is only available at independent dealers. Both have their advantages and weaknesses. Looking for more information about washers? Get the Yale Washer Buying Guide with features, specs and inside tops to all the brands like LG, Samsung, Electrolux, Whirlpool, Speed Queen and Maytag. Over 110,000 people have read a Yale Guide.